we have now finalised our “Writing in Web” -course and it was great success. In the “Writing in Web” -course we investigated technology supported alternative methods to inspire, encourage and support creative writing and collaboration. There are different kind of structures for writing courses, but typically they entail that you give or send your writings to others for review and commenting. In some courses, joint email address to which everyone has access has been used. While this works well for the course purpose and aims, this specific course developed within the CoCreat-project brings the idea a step further. The course design piloted the use of a weblog as platform for sharing and commenting on creative texts of different styles. The blog platform scaffolds and enables collaboration through peer reviewing, and allows easy commenting on the texts produced. The web based environment also allows easy inclusion of other media than written text, eg. images and video. This was not a key focus in our course, but it’s a possibility in future implementations. The use of the iPad with its Internet capabilities enables more or less real-time information inquiries and connection with the group. 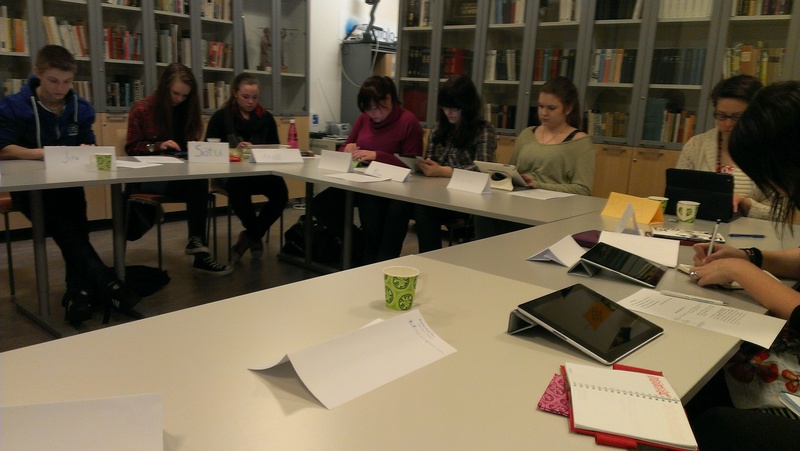 The course was held in Finnish and the blog is also in Finnish. You can find it at kirjoittaminenverkossa.wordpress.com. We are working on writing detailed description of the course which explains our approach for the course and guides you to implement it the same way yourself. Please come back later! Creative Collaboration -course started today in University of Oulu. You can follow it’s progress at cocreatcourse.wordpress.com. Unfortunately some course information is still in Finnish. Just before the Midsummer celebrations, The University of Lapland held a conference in Salla from 20th until 23rd of June. The theme of the conference was “Social Media in the Middle of nowhere” concentrating on different opportunities on how to involve social media into educational field and how it has already been done. There were different papers and presenters, one of them coming from the United States as well. From Tallinn University, Kersti Toming who is also participating in the CoCreat project presented her short paper as a first year master student and analyzed if Communities of Practice could be seen as one way of acquiring higher education. Her paper could be seen as one way of how to enable collaboration using different ICT-technologies (as CoCreat will results in new solutions for promoting creative collaboration in terms of new and innovative learning models based on social media and mobile technology). Since the environment, where the main activity of the project will take place, is SecondLife (one innovative environment that has not been used in practicing teaching that much) then from the student point of view, her remarks can be taken into account while designing the pilot course. Kersti Toming described in her article IMKE curriculum she’s currently following and made some remarks based on personal observation. As a result she concluded that from the student point of view, while designing a course, the creators must remember the issues of interactivity (although the notion itself is hard to define), leaving the opportunity for intensive communication between the students, the time factor (exchanging data quickly and preferably online), but nevertheless students should not be tied with strict demands, but more over given general guidelines. In case of Tallinn University master’s program, flexibility is something that is more and more given to the students. As these issues are related to using social media in studies, the project can use these little tips to make the outcome even more productive. As a result, her article and ideas were welcomed positively. One of the keynote speakers mentioned how important it is actually to have also the opinion of the other side to be heard (in this case the voice of the students). As the curriculum that Kersti follows was quite unusual and different for most of the participants, then the issue of non-traditional learning process was also discussed – whether attending courses and doing all the tasks via Internet without ever meeting your fellow students is actually efficient enough. Kersti’s personal experience shows that this innovative approach is actually what makes the studying process more enjoyable, which at the end gives confidence that CoCreat project is moving in the right direction. One other side mark was the participants’ interest for the project. Many of them came up to hear more about the CoCreat project and were positively surprised of its goals and ways of execution.